She broke down in tears during the standing ovation for her final walk at the Victoria's Secret Fashion Show in New York City on Thursday. 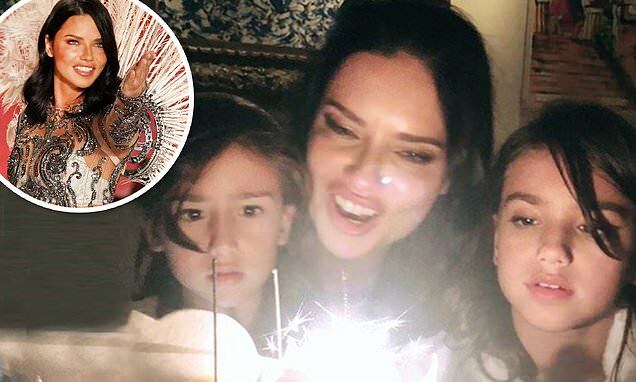 But Adriana Lima looked much happier as she enjoyed dinner with her daughters Valentina, eight, and Sienna, six, that evening. The 37-year-old Brazilian beauty posted a sweet snap of them all in the light of candles as they gazed in wonder at a huge cake. She captioned it: 'Celebrating with my family...thank you @berimbau.nyc for bringing some Brazilian taste to such a special night,' giving a shout out to the Greenwich Village restaurant. Adriana also shared an Instagram video of her best moments strutting her stuff for the upscale undies brand. And she offered a heart emoji 'to the best fans in the world! Love, Adriana. Touching tributes from fellow models poured in, including one from Georgia Fowler, 26, who shared the shot of Adriana in her sheer, crystal encrusted top, pink feather wings and pale blue undies.